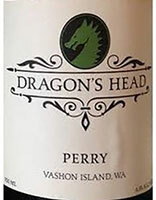 Named for the dragon that guards the apples of immortality in the Garden of Hesperides, Dragon’s Head Cider was founded in 2010 on Vashon Island. Ignoring their last name, owners Laura and Wes Cherry planted a beautiful orchard of apples and pears with production held on site. The Cherry’s don’t believe in cold storing their apples; they press during harvest season at its peak ripeness. Once pressed, the fruit ferments in winter, is blended in spring, and ready to be bottled by early summer. 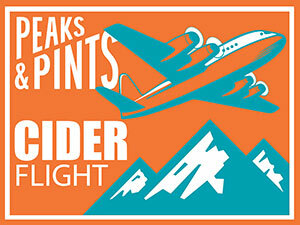 Today, Peaks and Pints presents a flight of Dragon’s Head Cider that we call Peaks and Pints Monday Cider Flight 4.15.19: Dragon’s Head. 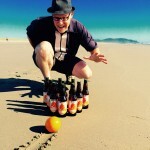 Wes and Laura Cherry take their Dragon’s Head Cider products from apple to bottle, blending fruit from their 2,200-tree orchard on Vashon Island with apples harvested by other small Washington family orchards. Their Wild Fermented is a farmhouse cider, which means rather than carefully selecting a yeast strain for the fermentation, they allowed the wild yeast present on the skin of the apples to ferment the cider. The result is a moderately tart cider with lemon and young pineapple flavors up front followed by mild spice and lingering grapefruit notes. Crafted from a blend of more than 20 traditional English and French cider apple varieties from Dragon’s Head Cider’s orchard on Vashon Island, these special apples contribute a richness of flavor and character to cider that can’t be achieved with ordinary culinary apples. This multiple award-winning cider — including back-to-back medaling at the Great Lakes International Cider and Perry Competition — Heritage hits the nose with butterscotch, hay, spice and a hint of leather. On the tongue, we get tangerine, honey, fennel and, of course, apple. Made with 100 percent pears, Dragon’s Head Perry features seedling pears that are unique to Vashon Island, harvested from trees that were likely planted by homesteaders around 100 years ago. These Vashon pears are blended with true English perry pears for a subtle sweetness, a delicate pear flavor, and lovely round tannins. It’s a multiple gold medalist.